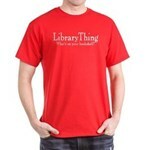 We’ve opened a CafePress store, ThingStore, so now you can have all the LibraryThing schwag you could ever want. And we’re selling it at the CafePress base prices, so it’s as cheap as possible for you. Wear it, carry it, drink from it, or watch it crawl (with your infant) across your floor—proudly!